Well, as my children reach their long-awaited goal of wellness, we're transitioning them from the GAPS diet to more starches and traditional foods. Plantains are delicious, well-liked, easy to digest, and they contain a friend to gut flora when eaten and prepared intentionally. What is this gut friend? Resistant starch! Resistant starch is a prebiotic (food for probiotics) which helps set the stage for a healthy colon. My kids love plantain fries and pancakes — both of which are made from ripe plantains. But it is green plantains, when left in their raw state, that contain this component of resistant starch. Once heated, green plantain's resistant starch transforms and no longer offers the same health benefits. And once ripe, yellow or black plantains have significantly less resistant starch. But I wanted to make a green plantain treat, something really good as well as being really healthy. So I made green plantain fruit leather and green plantain crackers! The lower temperatures used in dehydrating do not affect resistant starch. Use the recipe below for either fruit leather or crackers, depending on how long the puree is dehydrated and how much honey is used. We like both but prefer the crackers. They contain less honey, but are also quite versatile. They can accompany either sweet or savory foods. Top them with meat and cheese for mini cracker sandwiches, dip them in homemade guacamole, or… use any broken pieces on top of ice cream! Here is my boys' lunch. 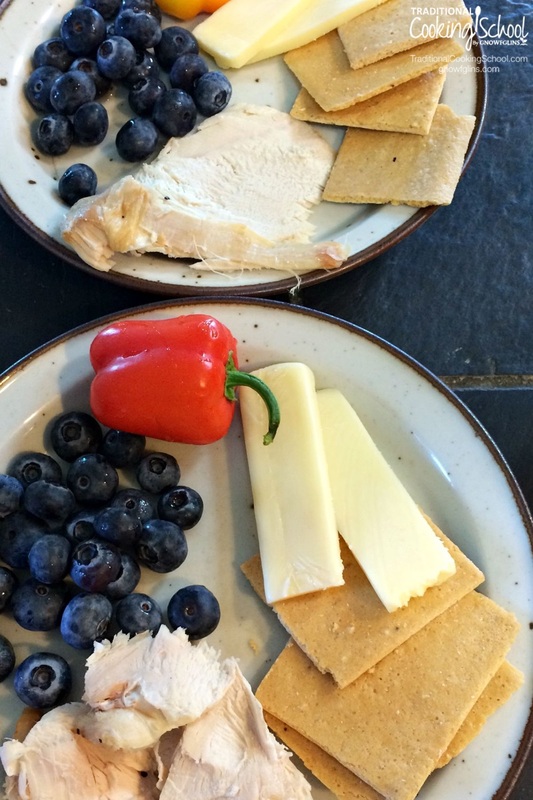 They loved making open-faced sandwiches with their crackers, cheese and meat. Green plantains, when left in their raw state, contain a component of resistant starch. Resistant starch is a prebiotic (food for probiotics) which helps set the stage for a healthy colon. 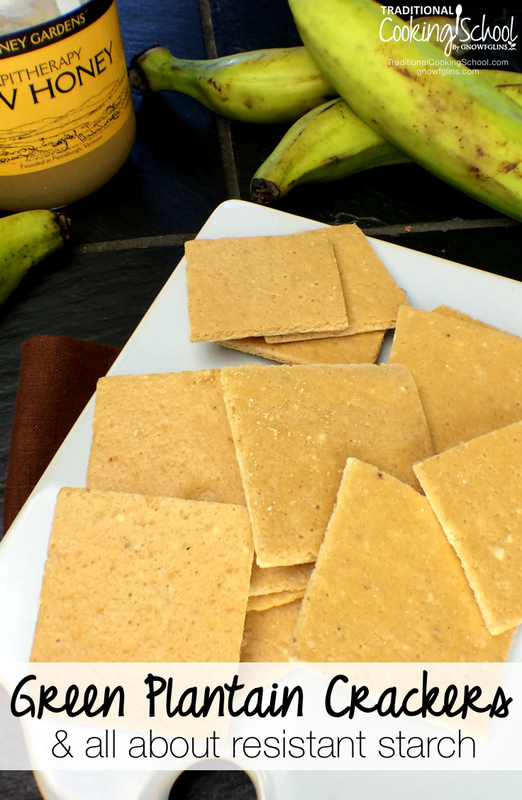 These Green Plantain Crackers area wonderful, healthy treat! Makes about 50 crackers, depending on their size and thickness. Peel the green plantains by first cutting the ends off. Next, cut plantains in half lengthwise and widthwise. By inserting your thumb between the sticky peel and the fruit you can now pry the peel off each quarter. Cut each quarter into 3 to 4 chunks and place in blender. Add water and sprinkle gelatin evenly over its surface. Blend for 30 to 50 seconds, until the honey has fully dissolved and the plantains are smooth (think smoothie consistency). Dislodge and blend any pieces of plantain that get stuck down by the blade. Pour puree into greased trays, rotating the pan(s) to spread puree out evenly. 1/8 to 1/4 inch thick is ideal. Dehydrate the crackers at 140 degrees (or lower) Fahrenheit, just until the puree becomes leathery and pliable. Use a long knife to cut desired cracker shapes, about 2" by 2" squares. By cutting the crackers at the pliable stage, cracking is avoided. If you wait to cut the crackers until they are crispy, some breaking will occur. Replace pan into dehydrator until crackers are crisp and crunchy. Serve or cool and store in a sealed container. To make fruit leather from this recipe, simply double the honey to 1/2 cup and remove puree from the dehydrator when it's dry or "tacky" to touch, yet still very pliable, and not yet crisp around the edges. The edges will dry out first so keep an eye on the perimeter to know when to remove. Do you have a favorite source of resistant starch in your diet? I'd love to hear about it! Interested in two variations? It's amazing what the right spice blend will do! 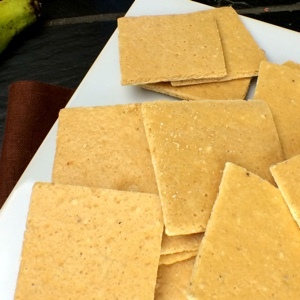 See these chips and crackers, (using the same Green Plantain Cracker base recipe), but made with taco seasoning or curry, excellent to serve with sprouted lentils or any Mexican or Indian dish, respectively. 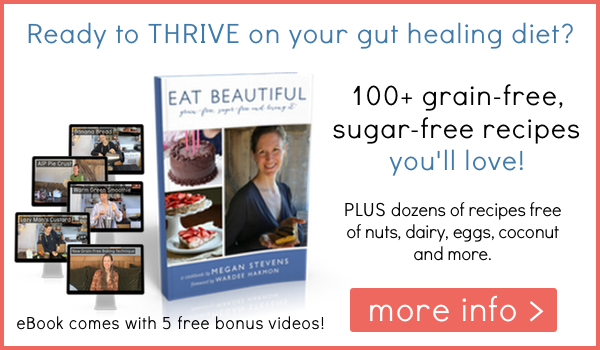 This post was featured in 82 Ways To Heal Your Gut, 60 Easy & Nourishing Picnic Recipes and 31 Lunchbox Recipes & Tips For Packing A Nourishing Lunch. These look wonderful! I’m wondering, what role does the gelatin play? Is it necessary for binding the plantain “dough”? yep..i am wondering if they can be made without…..
Hi Maeve, yes, that’s right. Because the recipe is egg-free the gelatin serves to bind the dough. Thanks for the question. i buy green only plantains. i love them in shakes, 1/3 of a plantain in each…reminiscient of a banana taste. i dont eat bananas anymore so its a great sub for me. my kids dont know theyre eating plantain n not banana wen i add a little stevia glycerite, like i do to my otherwise fruit-less shakes. I live in Far North Queensland, Australia, and we have a local banana grower who makes flour from green bananas. It’s quite good to use, and I think I’ll have a try at making these crackers using it. Love your emails. I have a question about the plantain crackers. If you do not have a dehydrator, Can you bake these in the oven and at what temperature and for how long? Hi Marlene, I do not think the recipe will work, in terms of baking, unless your oven temperature goes quite low; so it acts like a dehydrator. In this case, you would place your oven temperature to 150 or lower, if possible, and leave the door open about 3 inches to allow the air to circulate. Some people use this method; but obviously it does use a lot of energy. They dry in this manner, per the recipe, until they are crispy, many hours. My oven only goes down to 170 and no lower. So, what do I do to make the crackers? You can leave the oven door open at that temperature, if you want to; and this will allow air to circulate. I have a question about green plantains and resistant starch that I haven’t found an answer to yet and wondered if you might know. I have read that white potatoes that have been boiled *then cooled* have resistant starch (whereas if you ate a hot potato it wouldn’t contain the resistant starch, if I understand correctly); I am wondering if green plantains are similar – if they are cooked and then cooled, would we get the benefits of resistant starch? Hi Tara, thanks for the great question. What you said about potatoes is absolutely true. Plantains are a different category of resistant starch, or RS. With plantains, they need to be raw. This is why this recipe calls for dehydrating, protecting the RS. The greener the plantain, the more RS. When we cook plantains most of their RS is lost. So it sounds like all those *cooked* green plantains I’ve been eating aren’t doing me any good. 🙁 Well, they’ve been tasty, anyway. A quick question about the recipe: is the lime/lemon mainly for taste, or is it to help prevent the plantains from turning brown, or some other reason? My son doesn’t do well with citrus (I’m not sure why), so I’m wondering if it can be left out or if something else can be used instead. I wasn’t sure how these would turn out in my old-school dehydrator (and with my lack of skills!) but I made them tonight and thought I would leave my comments in case they are helpful to someone else. First off, I was spreading the batter as thinly as possible on my dehydrator trays in an effort to get thin, crispy crackers, but I found out that it IS possible to spread it too thin. When I went to check on them a couple hours into the drying process, the edges had thinned out even more leaving just a bunch of crackly dried batter crumbs. It was after about 3 hours in my dehydrator at 135 degrees that I took them out to cut them, but I should have done it a bit earlier, as the edges were already too dry and just broke and crumbled when I took a knife to them. Now I’ve got them back in the dehydrator to let the insides get more crispy, and I expect it will take another 2-3 hours or so. Hope these things help anyone else attempting to make these! About how long will they need to go in the dehydrator? Can I substitute maple syrup for honey? Honey gives my daughter a stomach ache.